Self-inking stamps contain a polymer stamp plate and an internal ink pad. They are available in several sizes. Custom self-inking stamps. Price includes standard USPS postage. Case color may be different than the one shown in the picture. All self-inking stamps must allow 1/8" print margin. 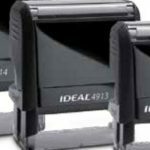 Ideal 4918 Custom Self-Inker Imprint area 5/8" x 3". If you would like to upload a copy of the signature do so here. Signatures must be supplied in black ink or sharp black and white copy only. Digital files must be high resolution. You may also fax it to (877) 550-4723. Your order cannot be processed until we receive a signature. If we can't use what you send, we will contact you to discuss options. Select the color of ink you want in the stamper. If this is a notary stamp and you are choosing other than black, be sure to verify that your state allows another impression color for your notary stamp. Email is our preferred method communication but we may need to call if we to your item in production. We need your phone number to communicate with you for payment and questions.